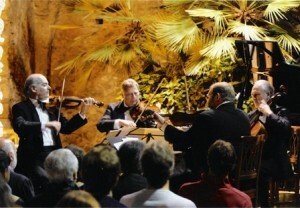 An alfresco garden corner – just perfect for a string quartet. 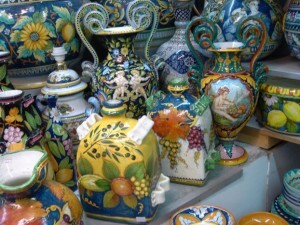 Vietri-sul-Mare, the gateway to the Amalfi Coast, is renowned for its colorful ceramics. Music and Markets Tours invites you to join us on the breathtakingly beautiful Amalfi Coast for an inspiring week of discovery and music. We’ll soak up the magical atmosphere of the “divine coast,” exploring delightful seaside towns, historic ceramic workshops, the ancient ruins of Pompeii, and the fabled isle of Capri during the day. We’ll enjoy evening performances of the artists of the Amalfi Coast Music Festival in cultural landmarks in the area’s most picturesque locations, such as Villa Rufolo in Ravello or the Cloister of St. Francis in Sorrento. We’ll take pleasure in this unique festival of the arts surrounded by the tastes, stunning vistas, and fragrances of Italy that have enchanted travelers for centuries. 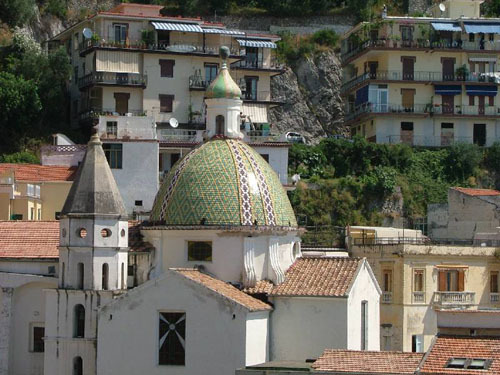 Clustered around a ceramic-domed church, the picturesque village of Cetara hugs a rocky seaside cliff.